If you have been startled by those scary scars and blemishes that go bump in the night like a blotched house of horrors when you look in the mirror, you have come to the right chapter to salvage your flaws. Copper peptides provide a delicate balance to the process of removing blemishes. These miraculous molecules help calm and rebuild new skin, allowing skin lesions to be slowly dissolved and replaced by fresh, unblemished skin. 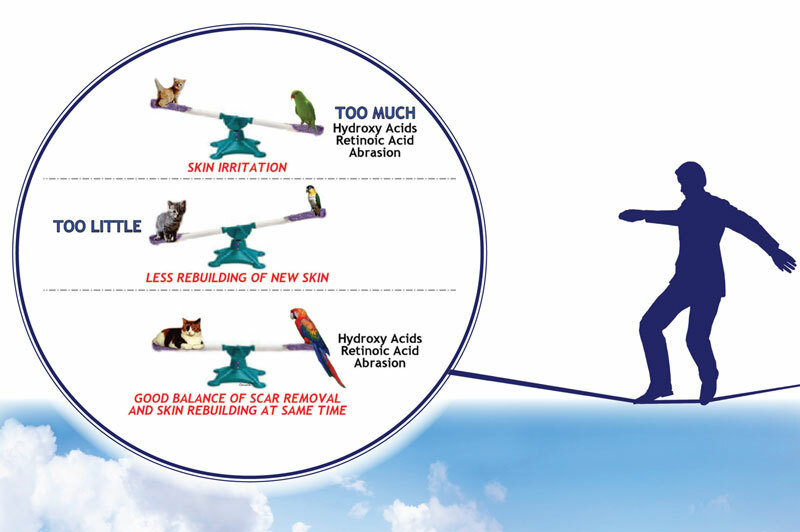 Caution: These methods are not intended to replace regular skin care by a physician. Lesions that are dark and irregular, those that bleed, or are infected should be promptly checked by a physician. What Can I Use to Get Rid of Skin Damage? Unsightly acne and scars crop up when cellular damage prompts our skin cells to grow in an abnormal manner. Many triggers can disfigure our skin including viruses, bacteria, heat, UV or X-ray radiation, and scar tissue that results from incomplete wound healing. This abnormal skin must be removed so that normal healthy skin can re-fill the area and create a smooth, unblemished complexion. First let’s ask ourselves, what causes the skin to heal abnormally in the first place? Today we know that healing requires a certain kind of environment, meaning that a number of molecular factors should be present in right concentrations to orchestrate and guide the extremely complex healing process, preventing it from going awry. The deficit or excess of such factors can turn healing into pretty messy business, resulting in prolonged inflammation, delayed healing, and hypo- or hyper-pigmentation. So here is the key to reversing damage: We selectively remove the blemish as gently as possible while creating an environment that fosters the creation of new healthy skin. Have you ever wondered how your skin does this? Why it is possible for it to rebirth just like a legendary Phoenix that burns itself and then rises from the ashes again? Today we know the answer. The source of the skin’s renovating power, or “gold reserve”, is hidden in the lowest part of the epidermis. They are called the stem cells— wonder cells that alone are endowed with an amazing capacity to transform into any cell that your skin needs to rebuild itself. Whenever there is considerable damage to the skin, which cannot be filled by existing skin cells, the stem cells start to grow and transform into cells needed for repair. The problem is that as we grow older, stem cells seem to gradually lose their ability to grow and produce repair cells when needed. That explains why the older we get, the longer it takes for our skin to heal after wounding or skin resurfacing. The good news is that copper peptides have been scientifically proven to re-charge the regenerative power of aged skin’s stem cells by restoring their production of p63—the stem cells’ anti-senescence protein. The renewed power of skin’s stem cells allows the skin to recover after resurfacing procedures faster and without side-effects. 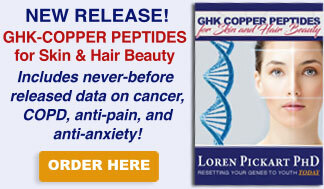 Another way copper peptides help your skin’s stem cells is by regulating copper level. Low tissue copper causes skin’s stem cell to proliferate, while high tissue copper cause them to differentiate into cells needed for repair. Decorin—Your Collagen Building Anti-Scar Protein! Scar tissue is formed from coarsely organized loose collagen, while proper skin structure requires well-organized, uniform collagen fibers that are woven into a tight and resilient network. The protein that oversees collagen formation is decorin—a small proteoglycan produced by skin fibroblasts. When there is not enough decorin, scars are formed. An addition of decorin to wounds prevents scar formation. Copper peptides have also been scientifically proven to increase decorin production in fibroblasts thus creating a proper wound healing environment. Not only do they ensure that the skin puts collagen to its proper use rather than re-creating the scar tissue again, but they also help tighten the skin making it more resilient and elastic after healing. No scars and fewer wrinkles—now isn’t that a dream come true! No matter which method of scar removal you may choose, whether it is gentle methods that I recommend such as hydroxy acids and retinoic acid or skin resurfacing methods, the first step for removing blemishes is to baby your skin back to health. Before you can remove lesions, you need to heal your skin and strengthen it. My recommendation is to use a combination of copper peptides and biological healing oil for two weeks to a month to help nurse your skin and revitalize it. Copper peptides used several weeks before scar removal ensure high activity of skin’s stem cells and prompt regeneration. When your skin is in better shape, you can then add the use of hydroxy acid and/or retinoic acid to speed skin-lesion removal. I recommend that you wait before using more aggressive methods and give gentler approaches a fair trial first. Rather than pain outweighing gain, I have found ways to remove blemishes while reducing irritation. It’s a balancing act that performs slower than some methods. However, it works gently and you will emerge with a clear radiant complexion. Over years of observations, I discovered a number of routines that help remove many types of blemishes (scars and pitted scars, skin tags, moles, sun damage, stretch marks, warts, hyperpigmentation, discoloration, and so on). If you use both hydroxy acids and copper peptide products, they work together in a balanced way to lessen irritation and eliminate blemishes. I recommend you alternate applications of moderate-strength hydroxy acids and copper peptide products. The hydroxy acids gradually loosen and dissolve the blemished tissue, while the copper peptides help rebuild new skin. This method is slow, but effective and does not cause excessive skin irritation. The hydroxy acids and copper peptides work best when used daily. Some with severe scars have experienced radiant results by applying the products up to four times daily (for example, a hydroxy acid at 8 a.m., a copper peptide product at noon, a hydroxy acid at 5 p.m., and a copper product before bedtime). You should see an improvement in about a month, but some old scars, such as stretch marks and keloid scars, may take six to eight months to slowly fade. Skin usually reverts to its pre-damage color. Strong hydroxy acids can make your skin more sensitive to sunlight. So use a sun protectant that contains a physical sunblocker such as pure titanium dioxide if you decide to apply hydroxy acids during the day. Or as mentioned earlier, apply hydroxy acids and/or retinoic acids at night and copper peptides in the daytime. Remember, blemish removal is a balancing act. If you remove too much blemished skin with hydroxy acids, you may end up with a gaping hole marring your beautiful complexion; if you use too few copper peptides, you may not rebuild your skin enough to see results. Depending on your skin type and condition, you may have to use more or less of the blemish-reduction products. In general, it is best to go slowly. Your skin can only change and improve so fast. When it comes to glowing skin, patience is a virtue. In a sense, hydroxy acids do their magic by inflicting damage in order to remove scars and blemishes, which are also forms of skin damage. Hydroxy acids, such as salicylic acid and lactic acid, are widely used as exfoliating agents and for skin peels. They remove dead skin cells and can also loosen and slowly dissolve skin lesions such as acne scars, skin tags, stretch marks, sun-damage marks, and moles. It may appear ironic that hydroxy acids need to cause damage in order to remove damage. 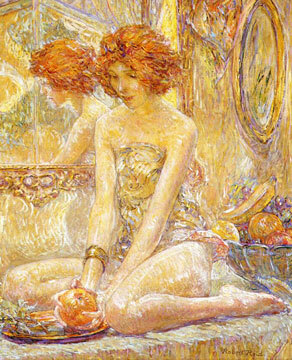 Aaah, life and skin can be an enigma as we balance cosmetic contradictions! So here is the nitty gritty secret behind the action of hydroxy acids. Normal healthy skin can resist the damage inflicted by hydroxy acids where as unhealthy lesions cannot survive this acidic assault. When healthy skin is treated with hydroxy acids, it quickly repairs with the aid of the copper peptides. The only difference is that this time it heals properly without bothering to restore skin lesions and imperfections. This means that your newly restored skin will be healthy, smooth and blemish-free, provided that this repair process goes through without a hitch. And that’s what copper peptides are there for—to ensure correct and flawless regeneration. The acidic environment created by the hydroxy acids also activates some enzymes and immune cells that help remove damaged skin and lesions. As a result, hydroxy acids will dissolve most skin lesions when used over a period of a month or longer allowing new unblemished skin to rise to the surface. This approach offers a gentle alternative to normal skin-peel techniques that employ a very strong hydroxy acid (or other peeling agent such as TCA or phenol). Skin peels work well under perfect circumstances. However, they can severely irritate skin when it is unable to fully regenerate and heal as a result of strong acid treatments. In other words, if too little skin rebuilding takes place, the peeling agent may cause further scarring or inflammation. However, by using an copper peptide product after the hydroxy acids, you create an environment that prompts the regeneration of normal, healthy skin. Hydroxy acids and copper peptides complement one another; while the repeated application of hydroxy acids slowly dissolves skin blemishes, copper peptides aid in the rebuilding of healthy, smooth skin. As the skin is rebuilt and scars are removed, the elastic properties of the skin pull it into a smooth surface. Methods that mildly abrade skin can also hasten the removal of scars, especially when you combine them with hydroxy acids and copper peptides. These abrasive techniques include microdermabrasion, microdermabrasion sponges or cloths, and needling (subcision). Some old scars get especially tough, fibrous and difficult to decompose. Physically abrasive techniques break down scars and thereby allow the hydroxy acids to start dissolving them. Microdermabrasion works well for elevated or flat scars. Microdermabrasion sponges or cloths work especially well for small skin lesions since you can focus on abrading a small area. The cloths cost about $10 each. But be careful, they are deceptively potent and you can easily overuse the product. Subcision, performed by an esthetician, can break up depressed scars such as pitted acne tissue. In this procedure, a needle (similar to a tattoo needle) disrupts the scar collagen and stimulates its replacement by newly formed collagen. The best results are achieved with several sessions. Some estheticians tell us that they use copper petpide products after the needling and see a much improved and faster clearing of the scar. However, do not apply the copper peptides until the wound has scabbed over and is no longer open or oozing liquid. In addition to reducing many types of scars, hydroxy acids and copper peptides can enhance healing after skin peels, laser resurfacing, and dermabrasion. The rest of this chapter will describe how to use hydroxy acids and copper peptides effectively during post- procedure recovery. While medium and deep chemical peels may improve damaged skin and promote a rosy glow, they also can produce severe irritation that leads to scars and prolonged redness. Oh no! I can read your mind now. How can a treatment that improves skin also damage it? Well, as we discussed, proper skin care requires a balanced approach. Although medium or deep peels may remove abnormal tissue faster, to ensure that the skin heals properly this time you need to create the right environment. 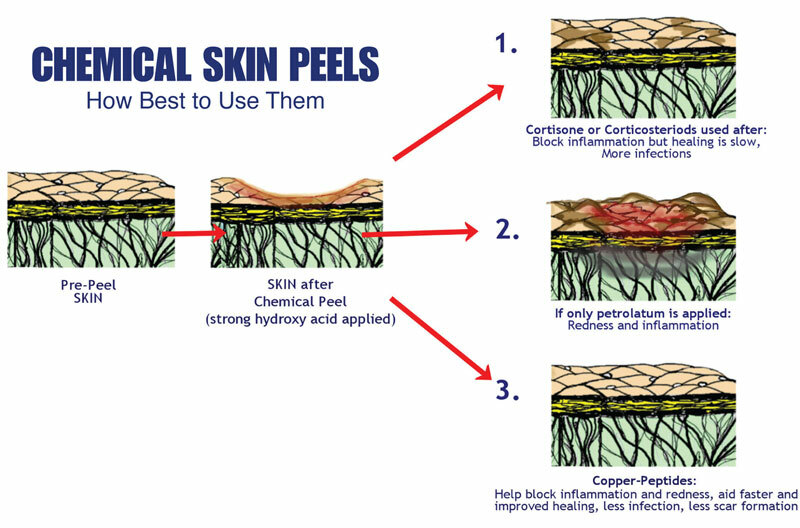 After a peel, you will probably want to apply some type of moisturizer and/ or anti-inflammatory to reduce irritation. Fortunately, copper peptides can rebuild our skin and reduce irritation. So it’s good-bye thin skin and hello to a beautiful complexion. When sun, chemicals, and other elements discolor and damage the skin we end up with either too much melanin (hyperpigmentation) or too little (hypopigmentation) which can create the illusion of a blotchy pincushion. Now that’s no fun! Hyperpigmentation often contributes to brown and red spots and highly pigmented lesions. In cases of hypopigmentation, the loss of pigment can appear as a white rash as seen in cases of vitiligo and albinism. We recommend that you treat hyper/ hypopigmented areas in the same manner as you would treat blemishes and scars. You can remove almost any skin blemish (this includes hyperpigmentation or hypopigmentation) with a combination of hydroxy acids, skin abrasion, and copper peptides. The hydroxy acids and abrasive methods slowly loosen and dissolve the blemished tissue while the copper peptide products help to rebuild new skin. 1. If you have oily-to-combination skin, apply a copper peptide serum product in the morning and hydroxy acid serum at night. Start the products lightly and then slowly increase the amount over time. 2. If you have dry-to-normal skin, use a copper peptide cream in the morning and hydroxy acid cream at night. 3. If you are not getting enough effect, try a copper peptide product that is stronger in concentration. 6. Daily supplements of 0.5 gram Vitamin C, 1 gram MSM, 1 gram of Flaxseed Oil and 500 mg of Borage Oil also help skin rebuilding. 7. 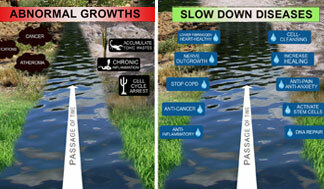 Stress inhibits skin repair and the rate of scar reduction as it increases blood cortisol. DHEA (75 to 100 mgs daily) may help block the cortisol effect and stimulate skin repair. But only take DHEA for short periods of time, such as one month, if you are experiencing great stress. 8. Regular aerobic exercise increases blood flow into the skin and speeds skin repair and scar reduction. According to recent studies, it also causes the DNA to produce more proteins that are characteristic of young skin, so you get a double benefit—faster healing and younger looking skin. Skin color will usually revert to its pre-damage color. If you look at a blemish, you will see that it is very different from surrounding skin. No matter what is the origin of the mark or what type of a scar it is—it will not have normal skin layers and will always be formed by rough, disorganized bundles of collagen. All of this makes it very difficult to deliver active ingredients into this area. First, exfoliation removes the upper layer of dead skin cells, so that active ingredients can be absorbed much more easily. However, if you have thick damage, or if you simply want to ensure that copper peptides are delivered exactly where you want them, you may consider combining copper peptide products with a technique called at-home microneedling. Medical needling has been used for many years by dermatologists to help trigger skin rejuvenation. 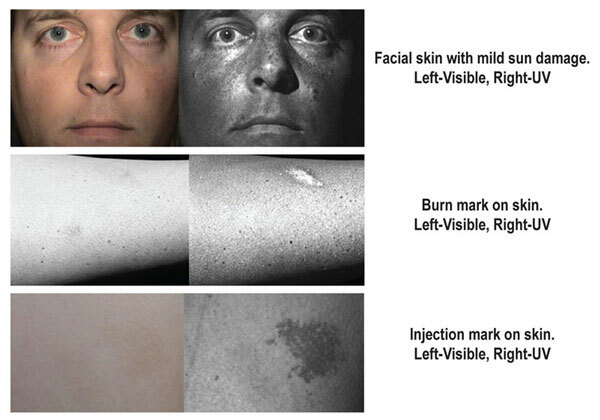 Even though it is very effective, this type of skin needling must be performed in a clinical setting, requires anesthesia, and may lead to irritation and sometimes hyperpigmentation. In contrast, microneedling is a gentler and much safer version of medical needling. It is a minimally invasive technique that uses very tiny needles to essentially create temporary pores. Microneedling devices are safe, very inexpensive, and can be used at home. A recent scientific study confirmed microneedling to be a safe and effective way to deliver copper peptides into skin. The rate and depth of penetration of copper peptides increased with the force of application. So, if you have just started using copper peptides with a needling device, it is always best to be very gentle at first. Always listen to your skin, and when in doubt—start slowly and proceed with caution. Microneedling in combination with using a client’s own platelet-rich plasma (which naturally contains GHK-Cu) was shown to be very effective in the treatment of atrophic marks. Others have reported success in treatment of stretch marks using microneedling. Forty women with stretch marks were divided to two groups—one was treated with microneedling and another with a combination of microdermabrasion and sonophoresis. The microneedling group showed much greater improvement compared to the second group. If in the “microdermabrasion plus sonophoresis” group, there was a 50% increase of collagen synthesis; in the “microneedling” group, there was a 90% increase! First, always cleanse the area thoroughly with a gentle, neutral pH cleanser. Of course, your hands should be completely clean as well. If your skin is red, irritated, experiencing an active breakout (or if you have any skin condition), please use copper peptides and biological oils to soothe the skin until any irritation is reduced, and wait on actual skin needling. 1. Gently roll on thoroughly cleansed skin, letting the device do the work for you. Avoid pressing too hard or rolling too swiftly. Always start with minimal pressure, then increase when you are sure it is well tolerated. 2. After rolling, apply a light amount of a copper peptide product. Many choose copper peptide serums as they can easily be diluted with water before applying to the area. 3. If needed, soothe skin after rolling with a moisturizing biological oil (such as emu oil or squalane). Skin microneedling can be safely performed on all skin colors and types. Those new to skin rolling should always start with a shorter length needle (0.5 mm is perfect for general facial use). Finally, it is very important to give your skin a good rest between needling sessions. Usually once a week, or once every two weeks, achieves excellent results with no side effects. Regular use of copper peptide serums and oil moisturizers between sessions will help restore smoothness and suppleness to your skin. There are at least three mechanisms of skin darkening. The first, includes an increase of melanin production in response to skin injury. The second results from local accumulation of dead skin cells (keratosis) which leads to a darkening of the skin color. Finally, abnormal proliferation of melanocytes in response to a chronic damage can result in lentigo (or what is commonly referred to as age spots). Hyperpigmentation that occurs after aggressive cosmetic procedures such as lasers, deep chemical peels etc., or after acute skin traumas, is usually because of melanin. Stressed keratinocytes (skin cells) produce signal molecules that command pigment cells (melanocytes) to increase melanin production. In the case of very acute or repetitive stress injury, skin cells may become permanently hyper-activated (or “reprogrammed”) and the darker spot will persist. Keratosis also results in skin discoloration, since areas with thick horny layers look darker. This can be corrected by consistent alpha hydroxy acid application. Dark spots on the skin of elderly people (lentigo) may be the result of decades of sun damage and possibly from other damaging factors as well. In case of lentigo, there is an increased number of melanocytes in the darker area. Lentigo may be more difficult to remove than normal hyperpigmentation. What Is "Buried Skin Damage"? At times removing damaged skin can cause deeply buried scar tissue to become more visible. It is this buried skin damage that is often covered over with normal skin. As such deep damage becomes visible, it is important to focus on the use of copper peptides (to trigger faster production of healthy skin cells) and hydroxy acids (to break down and remove damaged tissue). Can you see buried skin damage? What can the UVCorderTM reveal? UVCorderTM is a hand-held digital ultraviolet imaging solution that serves a very practical purpose. In the case of revealing buried skin damage, excess melanin production is much easier to show in the UV light band than in the visible band. Scars and blemishes can be seen in the UV months after they have faded to the naked eye. The only method to remodel the skin is the removal of buried skin damage and subsequent stimulation of healthy skin cell production. 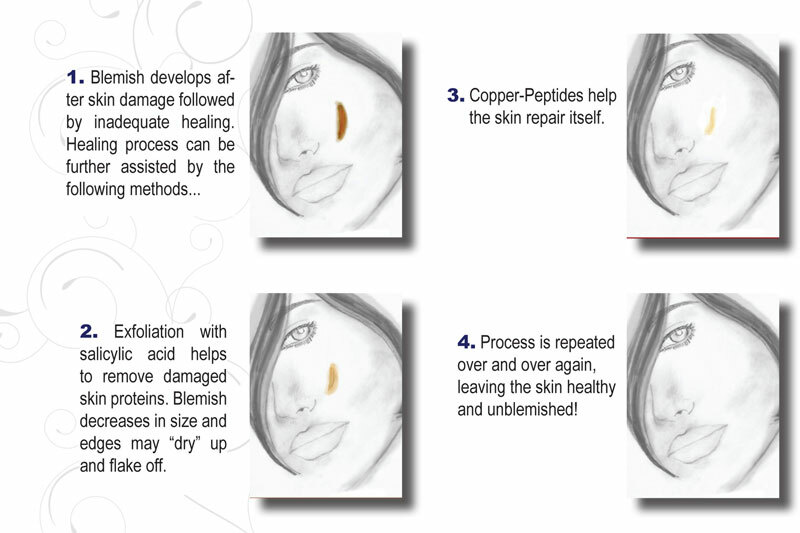 This formula of using copper peptides plus abrasion to repair damage is not a cosmetic cover up or “quick-fix”. It takes time, patience, and consistency. But many have found it effective in helping remove damage from the inside out—in time revealing younger, healthier, tighter skin.